Ash Wednesday is one of the occasional services of the church year. I alter up the text a bit, because I think the assigned texts don’t reflect our actual practice. It is not that the historic practices are bad, just that we don’t do them. I think we might consider them in the right light if we understood the section of the sermon on the mount right after them. And by understood what I really mean is feel cut to the heart by it. That is what this attempts. The recording is our Children’s Christmas Pageant. There is a short homily by me at the start and then the kids you see in the photos take over and renew the story of the Son given to us. Their bother, Immanuel. Have you ever read a biblical passage that just doesn’t make sense or maybe I should say makes sense in very bad ways? Then this sermon is for you. This text is one that has often struck me wrong and is one that when I pushed or heard others ask question the explanations would just “keep digging.” When I hit a passage like this I typically find one of three things: 1) the translators have chosen a particular word or phrase that carries the wrong connotations or ignores the larger context, 2) the cultural assumptions of the writers are just different than ours or 3) I have a sin problem that is more or less directly being addressed by the text. In the first two categories it is not that our English translations are bad, we should just recognize that the task of translation is an art. With this text I think it falls into my first category. So, this sermon starts with my problem, which I think would probably be familiar, and attempts to think our way to something that doesn’t make Jesus a liar or the Father a cretin. Hopefully the path is full of the gospel, helping us not to lose heart. Worship note: I’ve left in our final hymn of the day. Lutheran Service Book 652 – Father, We Thank Thee. The text is from the Didache, the earliest catechism of the church from the 2nd century. 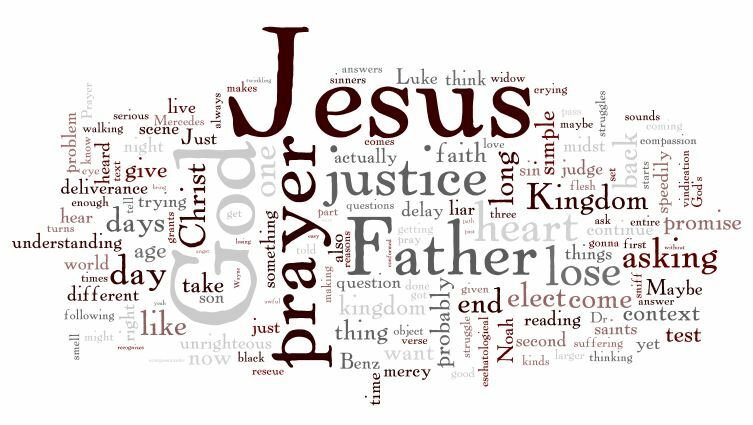 I left it in because I think it captured the two main points almost perfectly: 1) the Father that Jesus reveals is full of compassion for the sinner and 2) that we do not lose heart by staying connected in prayer. The second verse is a mighty example of the prayer “your Kingdom come”.